Riau Tourism - Stanum Recreational Park is one of the mainstay tourist Kampar Regency and Riau Province. The park is crowded on Sundays and other holidays. In this Stanum park there are different types of flowers. The place is attractive and strategic because it is above the hills the air is cool and shady trees with a beautiful natural panorama. From the park visitors can also see the beauty seantaro Bangkinang city and surrounding areas. Located about 63 kilometers west of the city of Pekanbaru. Approximately 1 (one) kilometers away from the city Bangkinang, Kampar regency capital. In the region there are various facilities, such as baths, mosque, hall, motels, villas, restaurants, stage entertainment, cinemas, parks fishing, paddle duck arena and swimming pool. 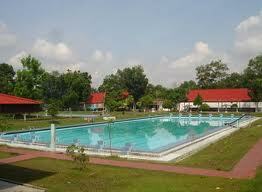 Location Bangkinang Stanum Recreational Park close to downtown and highways.